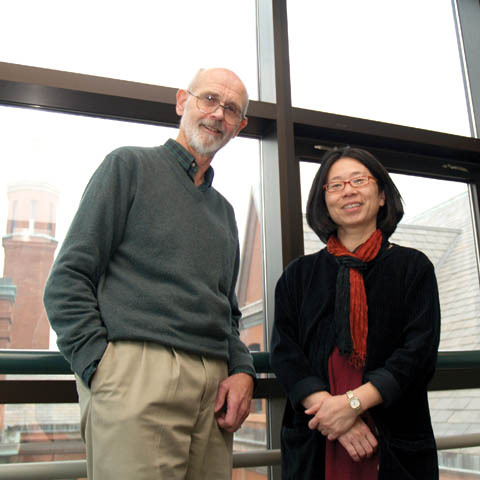 DATABASE CREATORS - Architecture professors James Potter and Rumiko Handa have created a course and online database linking elements of architecture with the humanities. Photo by Troy Fedderson/University Communications. Sir Isaac Newton had his apple. Ben Franklin had a lightning bolt. James Potter and Rumiko Handa had lunch. When English professor Seanna Oakley arrived at UNL, she was eager to work with the Institute of Ethnic Studies, particularly the African and African American Studies program, which aligned with her area of specialty. The Sheldon Memorial Art Gallery is launching a program to make its collections and exhibitions an integral part of the practice of teaching and learning at UNL. An affiliation with a national organization is helping strengthen the UNL Honors Program. You may feel very up-to-date when you pull up at the pump to fill your tank with ethanol, but Nebraskans more than 70 years ago were doing exactly the same thing. Dan Barrett never believed he would see construction management converted into a spectator sport. It's no secret that most of Nebraska's rural counties have been losing population in recent decades, but a recent study of census data by Randy Cantrell, extension professor with the University of Nebraska Rural Initiative, shows that more than half those counties actually saw an aggregate increase in the size of their labor force in recent years. Mom's guitar, a John Denver song book and a brother's request have led Curt Bright to the main stage of the Lied Center for Performing Arts. The Sheldon Memorial Art Gallery and Sculpture Garden recently completed a two-year Institute of Museum and Library Services grant that helped to fund the conservation of six of its outdoor sculptures. The life of Ed "Big Daddy" Roth - presented in Kandy color and recorded with real 426 hemi engines - opens Nov. 10 at the Mary Riepma Ross Media Arts Center. An exhibition featuring rugs crafted and designed by Lulu Myers of Polk is on display through Dec. 8 at the Robert Hillestad Textiles Gallery. Guitarist Dominic Gaudious returns to Lincoln for a 7:30 p.m. Nov. 30 performance in the East Union Great Plains Room. The performance is part of the Lied Center for Performing Arts' East Campus Series. Comedian and Omaha native Pat Hazell performs at 7:30 p.m. Nov. 15 at the Lied Center for Performing Arts. He will be joined by Henry Cho, Jim Brogan and Wayne Cotter for the touring show "The Good Humor Men." Many of this column's readers have watched an amaryllis emerge from its hard bulb to flower. To me they seem unworldly, perhaps a little dangerous, like a wild bird you don't want to get too close to. Here Connie Wanek of Duluth, Minn., takes a close and playful look at an amaryllis that looks right back at her.